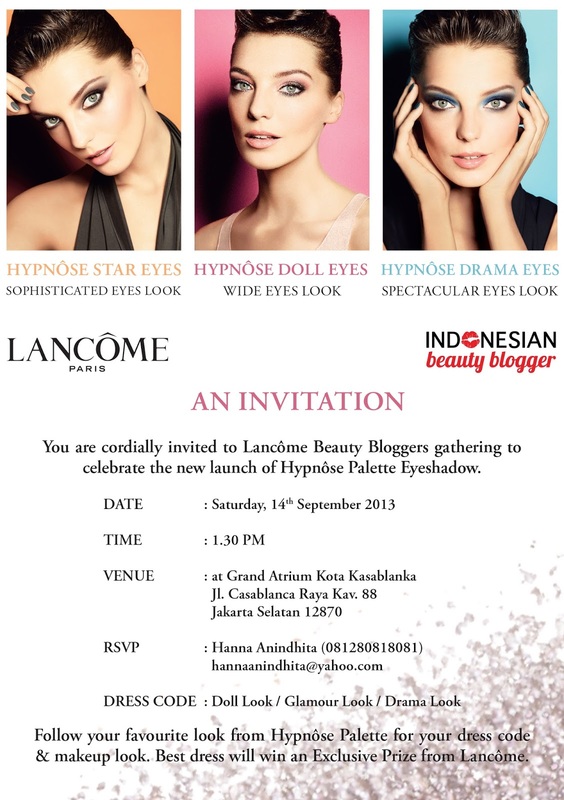 Finally, Lancôme released their newest eyeshadow palette in Indonesia ; Lancôme Hypnôse Palette. 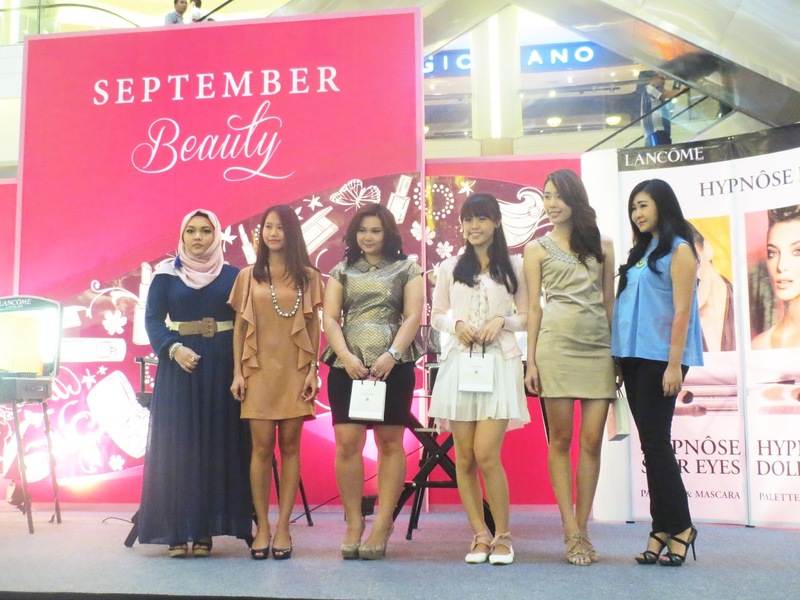 In collaboration with Indonesian Beauty Blogger (IBB), Lancôme held an awesome event for the launching. Located at Kota Kasablanka Mall, Lancôme invited many beauty bloggers to join the launching event. 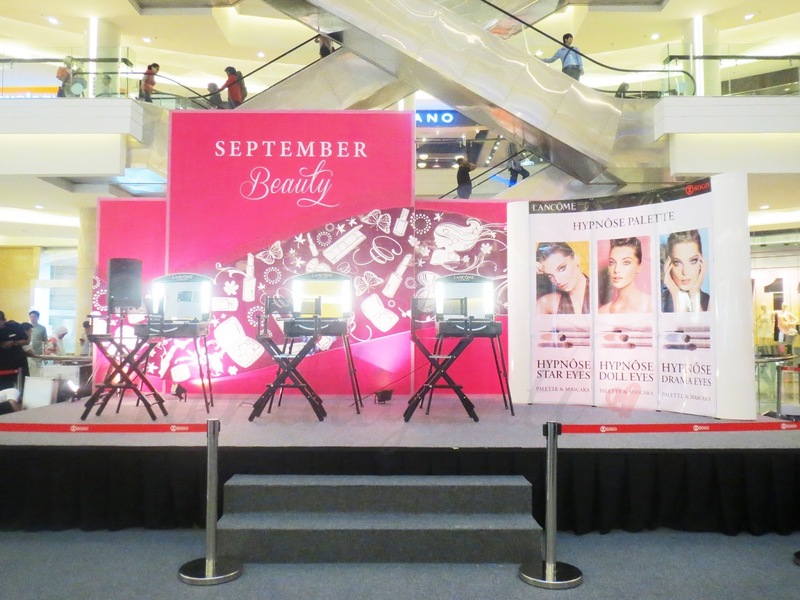 I was so excited to take a part in this event because I always adore Lancôme Eyeshadow Palette (and also their blushes). 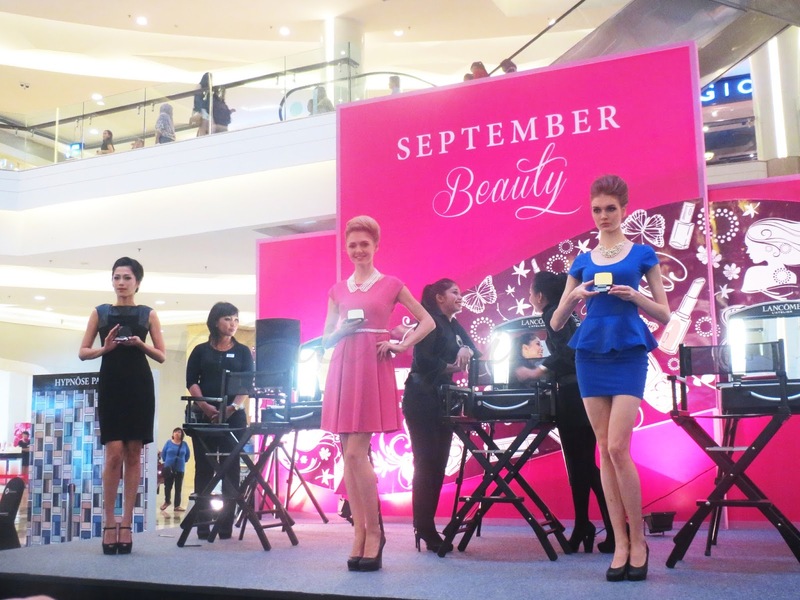 The event itself was take a place in main atrium of Kota Kasablanka Mall. 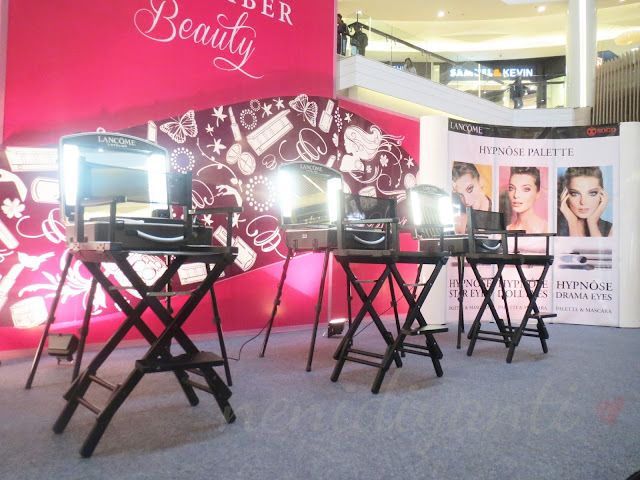 Here's the registration desk where all the beauty bloggers should write on a guess book. Besides it, team of Lancôme also arranged the main products for this event. 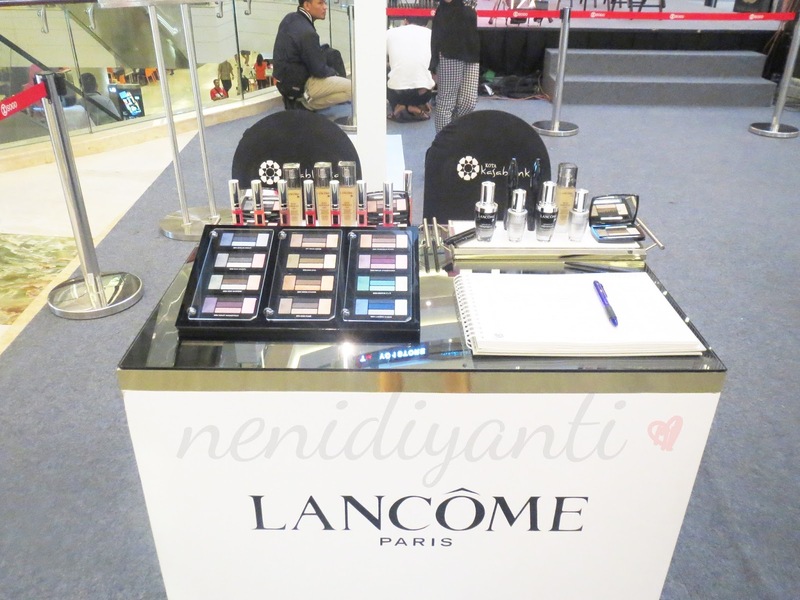 Team of Lancôme putted a whole sets of Lancôme Hypnôse Palette on the registration desk and it made me so tempting to do swatching. Yes, I did it! Hahahaha. After sign the guess book, I immediately swatched some shades onto my hand. 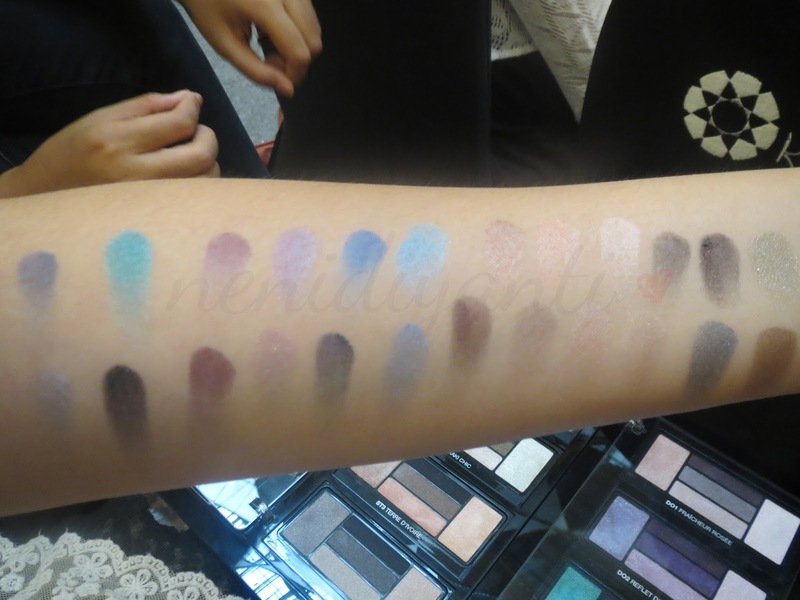 I was so in love with ST3 Terre Dlvoire and D01 Fraicheur Rosee. I also like the D03 Menthe a L'O for the gorgeous blue shades. Along with the Lancôme Hypnôse Palettes, there was also Lancôme Génifique and Lancôme Mat Miracle. Not forget to mention the Lancôme Hypnôse Star mascara. Yeah, they are the main stars for that day! Three makeup table and chairs also arranged on the stage for the makeup demo. Seriusan.... Muka gue kok tengil banget yach disini??? HAHAHAHAHA Mana gendut lagi. Take a look at the crowded. Wohoooo..! 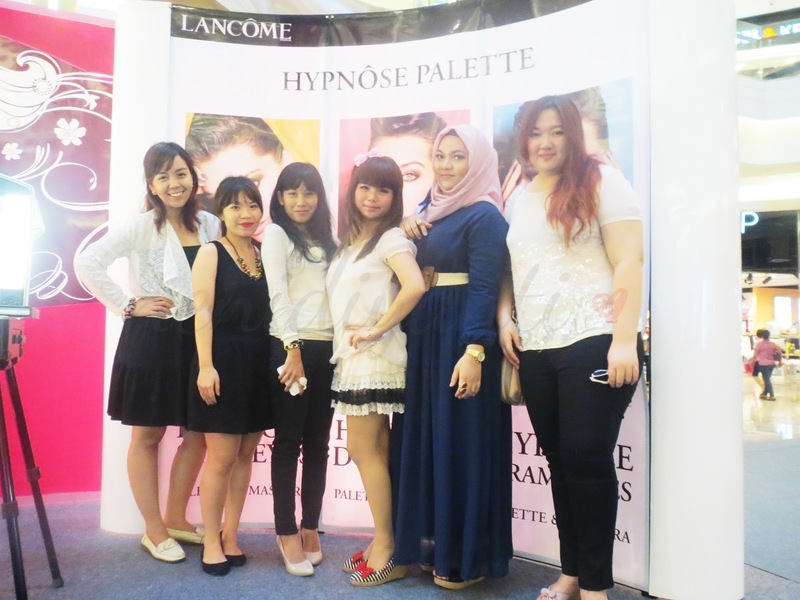 So many beauty bloggers came to became a witness for Lancôme Hypnôse Palette Launching. After the opening, we go straight to the makeup demo. Yay! PS : you must know that I had been eyeing two western models (・・)σ (in below) since the event haven't started yet. They were so preettttyyyyy...~~~ and tall. So, let's say she's the model #1. She became a model for Hypnôse Drama look. Honestly, she's my favorite. She's amazingly pretty but she never smile along the event (even until the event done). This is the super minus point, it was like I gave her 100 points score but the double zero dropped somewhere LOL. Let's say this is Model #2. She became a model for Hypnôse Doll look. She's pretty and smiling all the time. I adore her loveliness and also her height. Yes, she's tall, not as tall as the Model #1 but at least she's taller than me HAHA. This is Model #3 and she became a model for Hypnôse Star look. And do you notice that her MUA is Ms. Nilla from Lancôme? 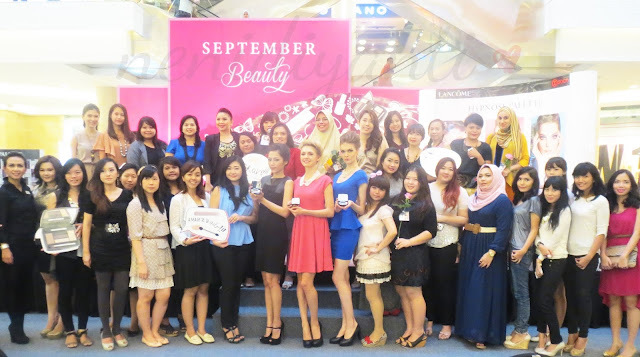 If you following Lancôme twitter or fanpage, you must know that she's the one who join makeup competition abroad. The Lancôme's MUA were busy polished those pretty models. 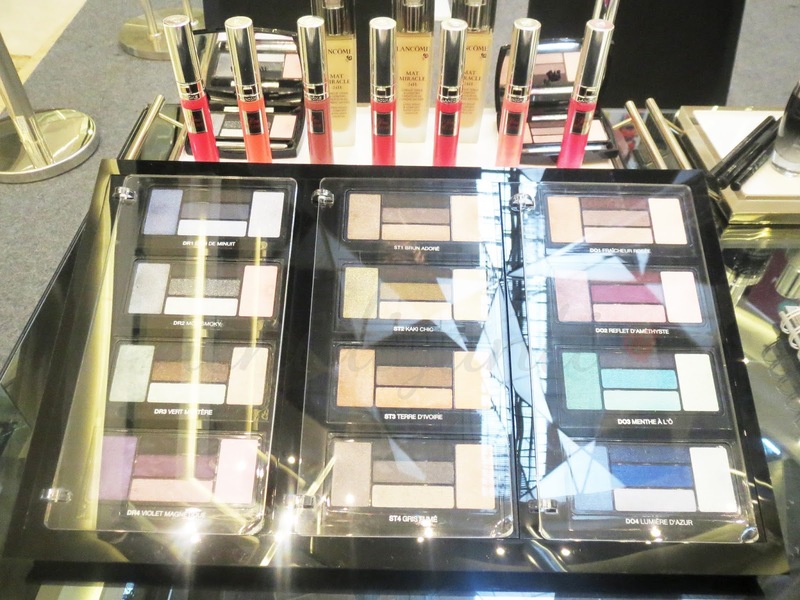 While the MUAs busy with the makeup demo, team of Lancôme gave us a chance to take a look of their latest products closer (and do swatch ofc). Do you see the BA hold the Lancôme Hypnôse Palette vertically? She wants to show us that the sponge and brush in Lancôme Hypnôse Palette won't be drop due to its magnetic feature. So here I am, proofing that it was real. I held the palette vertically and nothing fall down. I swatched many shades onto my hand. The shades are just beautiful! Besides having so many beautiful shades, this palette also can be used with dry or wet technique. So you can dip the sponge into the water or tap it on (another larger) wet sponge then swatch the eyeshadow and put it on your eyelid. It will make your eyeshadow last longer on your eyelid. 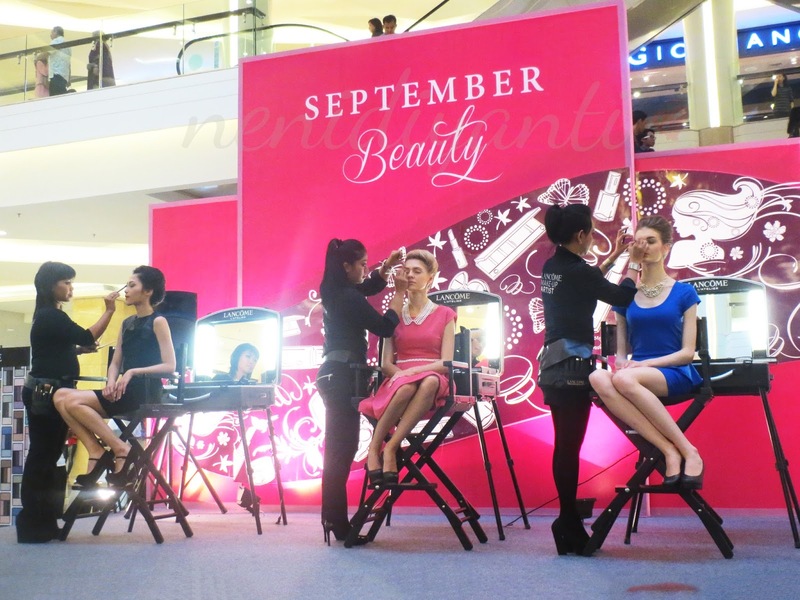 The makeup demo was done and those three models continue with showing their makeup to the audience. As written on the invitation, there will a best dress competition. And these pretty ladies are the ones who won it. I had so much fun at the event. 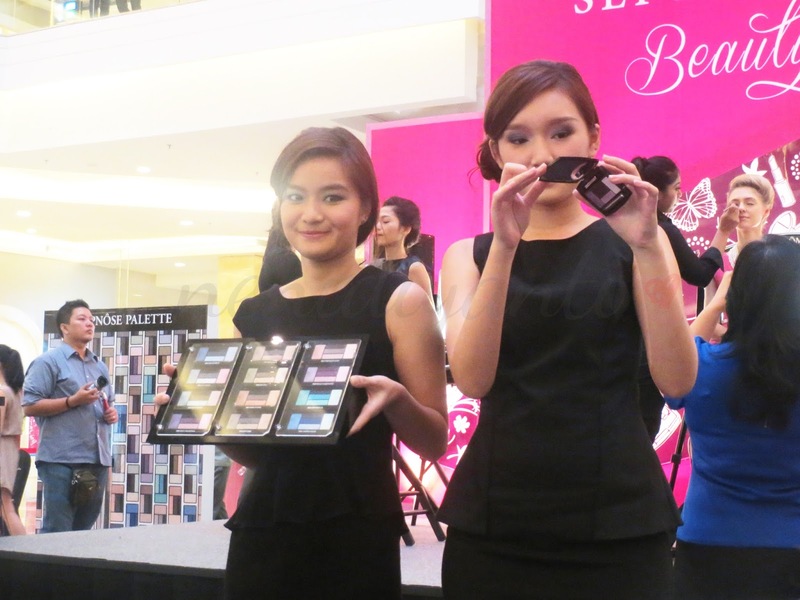 eyeshadow palette nya bikin mupeng, ada review terpisah ngag ini ntar? 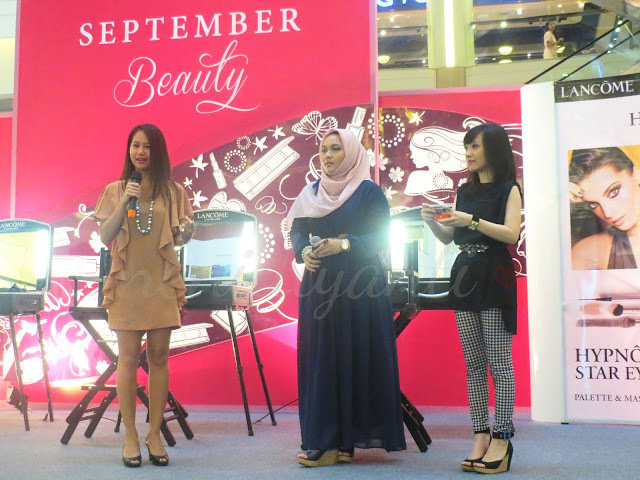 emang cakep banget loch eyeshadow nya. 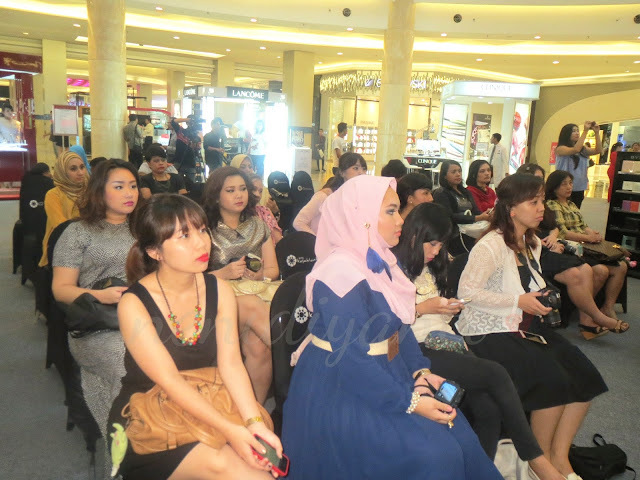 aku mau izin copy foto event report ini buat dimasukin ke blog aku (and i will also link it to your blog) boleh? kmrn itu soalnya telat dateng dan ga sempet foto-foto banyak.. huhuhuhu..
what an adorable blog! so happy i came across it! 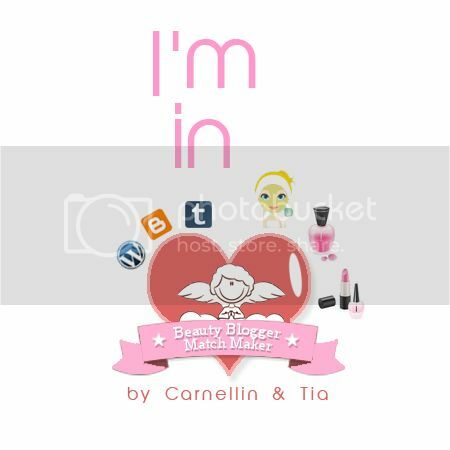 I'm new around here, glad to see many indonesia blogger though!